Schaeffler has set up its eMobility Systems division to be able to focus its activities around alternative drives even more effectively. In this facility, we are bringing together the expertise in electric mobility from all Schaeffler companies around the world. Several hundred engineers are collaborating here in interdisciplinary networks to develop new systems and units, and these activities are by no means limited to mobility on four wheels. The eMobility Systems division considers itself an open concept rather than a self-contained unit: Collaboration with partners from industry and universities is not only welcomed, but considered necessary. It cuts development times and helps obtain feedback from future users of the innovations being developed as the research progresses. Schaeffler’s E-Wheel Drive electric wheel hub drive is the optimum solution for tomorrow’s mobility. In this second-generation version of the highly-integrated wheel hub drive, all components required for drive, deceleration, and driving safety – like the electric motor, power electronics, controller, brake, and cooling system – are installed inside the wheel rim. They boast technical key data of up to 40 kW per drive, and a continuous output of 2 x 33 kW. When viewed as a traditional reading, this equates to 110 and 90 horsepower, respectively. The liquid-cooled wheel hub drive in its current stage of development also delivers up to 700 Nm of torque. 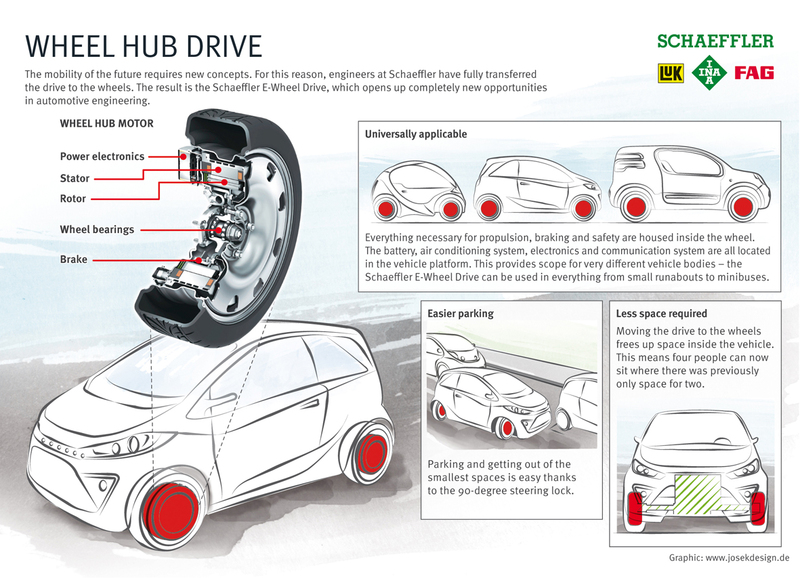 In comparison to the first-generation wheel hub drive, which was first exhibited in Schaeffler’s Opel Corsa-based Schaeffler Hybrid concept car in 2010, the current E-Wheel-Drive thus features an output increase of one-third, as well as 75% more torque. 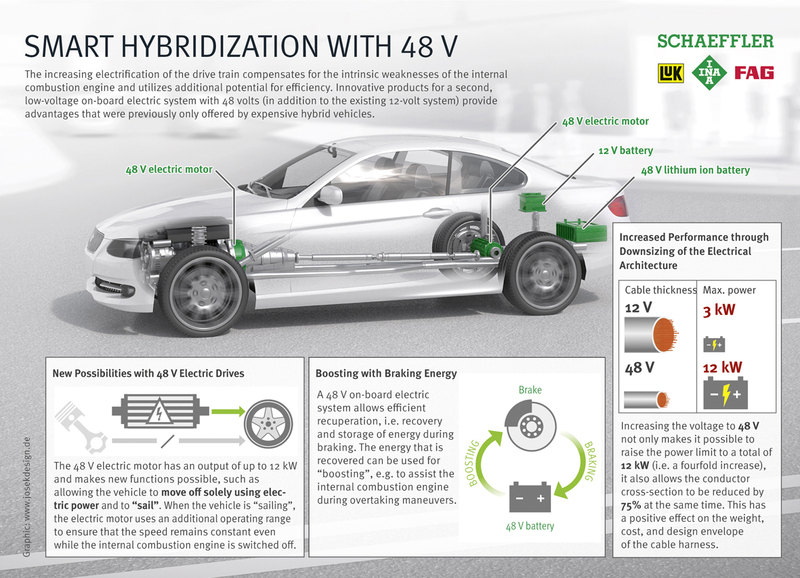 The electrical voltage of the high-voltage drive is 360 to 420 V.
With the electric axle, Schaeffler offers another very interesting family of products for advanced and high-performance hybrid vehicles. The drive element also has a modular design and can thus be adapted to suit the customer’s specific requirements. 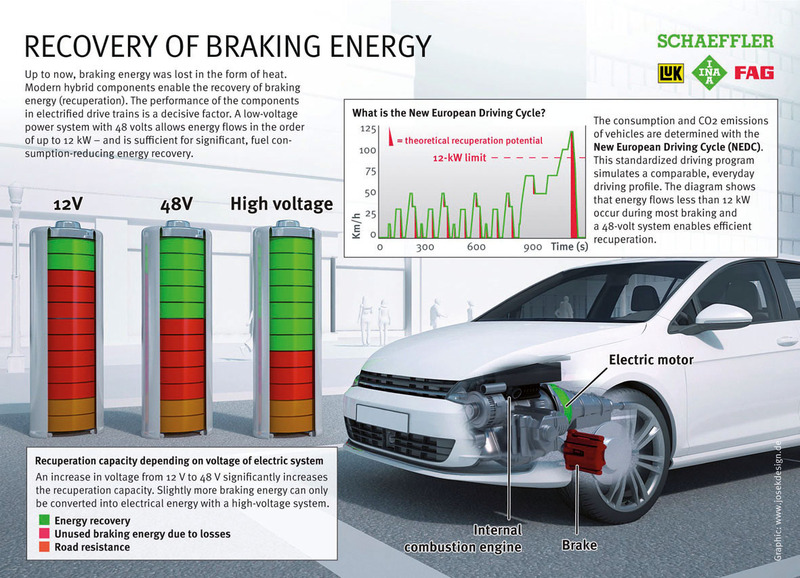 Schaeffler’s electric axle is the ideal solution for hybrid vehicles with all-wheel drive. The range here spans from electric drives and the transmissions and differentials that can be connected to them through to Schaeffler’s eDifferential, a multi-gear electric drive axle with two electric motors. The more high-performance electric motor supplies the drive power and energy recovery, while its lower-performance counterpart – which is mounted on the other side of the drive module – allows so-called torque vectoring. This describes the selective distribution of torque to the wheels, which increases driving dynamics and safety. 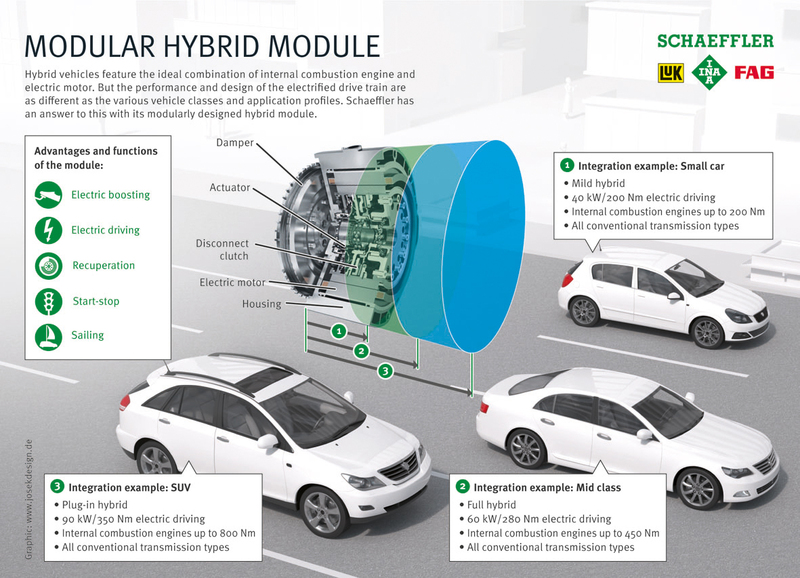 Schaeffler's 48-volt hybrid module provides a point of entry into hybridization and offers attractive potential for reducing CO2 emissions. The disk-shaped, compact hybrid module for the electrification of vehicles with manual transmissions is installed as a unit between the engine and transmission. No transmission modifications or water cooling systems are required. The main components of the 48-volt hybrid module are the electric motor (48 V / 12 kW) and an integrated automatic disconnect and starting clutch. The disconnect clutch decouples the internal combustion engine and allows the vehicle to be driven electrically. The impulse clutch offers a high level of comfort when restarting the engine. All starts can be carried out via the disconnect clutch, so an additional engine starting system is not required.